Asparagus is one of my absolute favorite vegetables, so I’m really excited that it’s back in season! My whole family loves them too. As is standard in our house growing up, anything we loved was affectionately given many nicknames that evolved over time. (Example: Our black lab, who is giant. Drover, Woover, Woov, Big Dog, Grande.) Asparagus was no exception. AH-spah-rah-gus, Asp-ar-ah-gi, A-spar-ah-mah-whoz-it. Our family is weird. Since it’s now spring and I’ve already bought many bunches of my asparagus, I wanted to share a simple recipe with you that lets asparagus shine in a quick and easy recipe for those days you want something non-complicated. 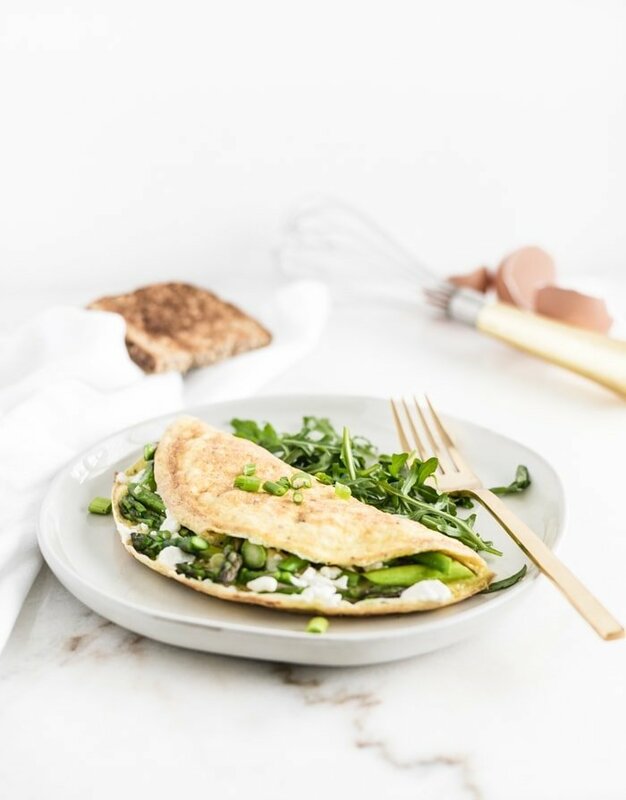 This asparagus goat cheese omelette fits the bill perfectly, which is why I chose it for this month’s Recipe Redux theme, Healthy Meals with Less than 7 ingredients! 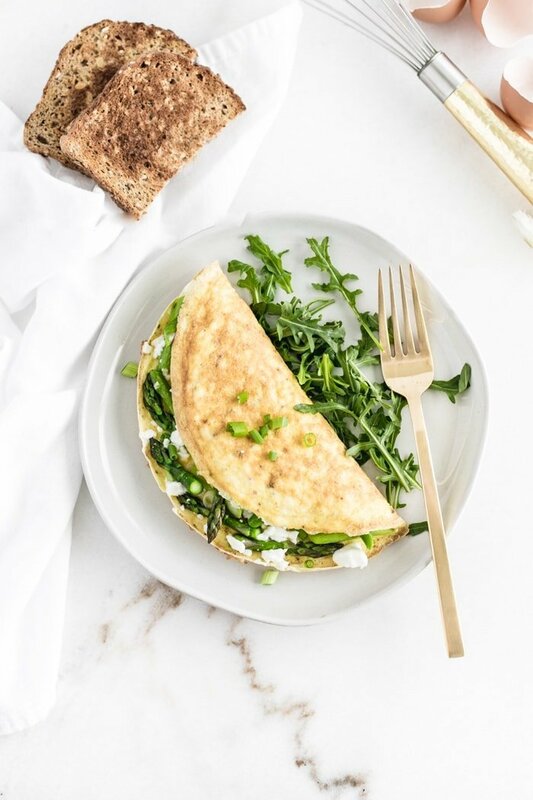 This yummy omelette is super easy to make on a weekend (or even a weekday) morning when you need to get out the door in a hurry, and it’s got 14 grams of filling lean protein to keep you going until lunch. It’s also just as simple to whip up for a speedy weeknight dinner when you’re tired and haven’t grocery shopped in a while (it’s only got 7 ingredients that you’re sure to have in your refrigerator!). 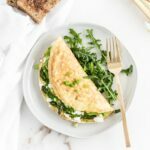 The key to making this omelette painless is in the technique. Use a nonstick skillet so that your eggs will slide out easily without a ton of oil. And have a plate (paper works fine) to pour your cooked asparagus on, and then once you’ve put it back into the pan with the eggs, to cover the pan with. Then do a simple fold-over style omelet instead of trying to get fancy with a tri-fold. This is how I make all of my omelettes (I eat at least 2 a week) and it makes for less mess, even cooking of your eggs, and easy cleanup. Which is what we all want, right? 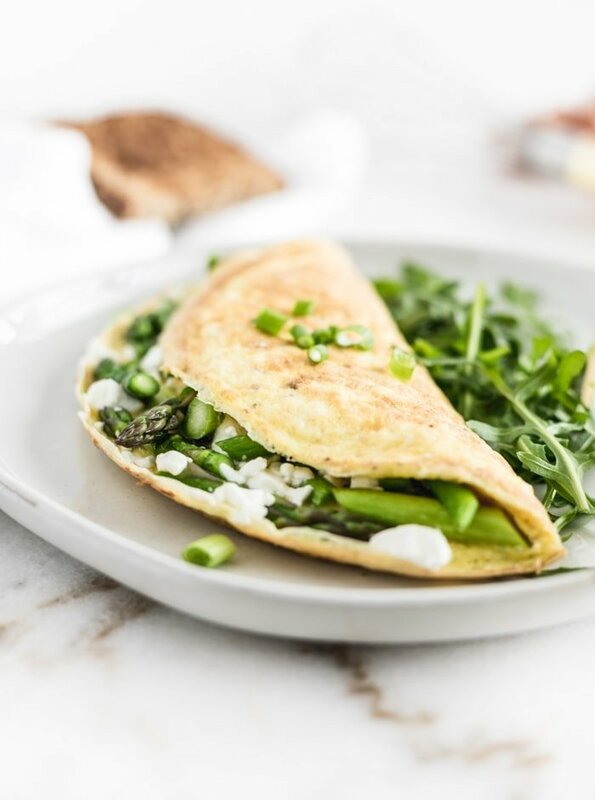 I love the simple combination of crisp asparagus, creamy goat cheese, and eggs in this asparagus and goat cheese omelette. It’s super satisfying and has plenty of flavor without a lot of planning or making a huge mess in your kitchen. To round out your meal, simply add a piece of whole grain toast and fresh fruit and you’re good to go! Now you can spend time doing other things, like going outside, or making Easter cookies (or doing your taxes? – nah.) You could also come up with a new nickname for your favorite veggie. Just a thought. Heat a small non-stick skillet over medium heat. Add 1 tsp oil. Wash and trim asparagus. Cut into 1 inch pieces. Mince garlic. Add asparagus and garlic to skillet with oil and cook until asparagus are bright green, about 4 minutes. Remove from pan and set aside. Meanwhile, in a small bowl, whisk eggs, water, salt and pepper. Turn heat to low and add remaining teaspoon of oil to skillet. Lightly spread oil around the entire skillet with a paper towel. Pour in egg mixture. Cook on low until eggs are almost set, about 5 minutes. 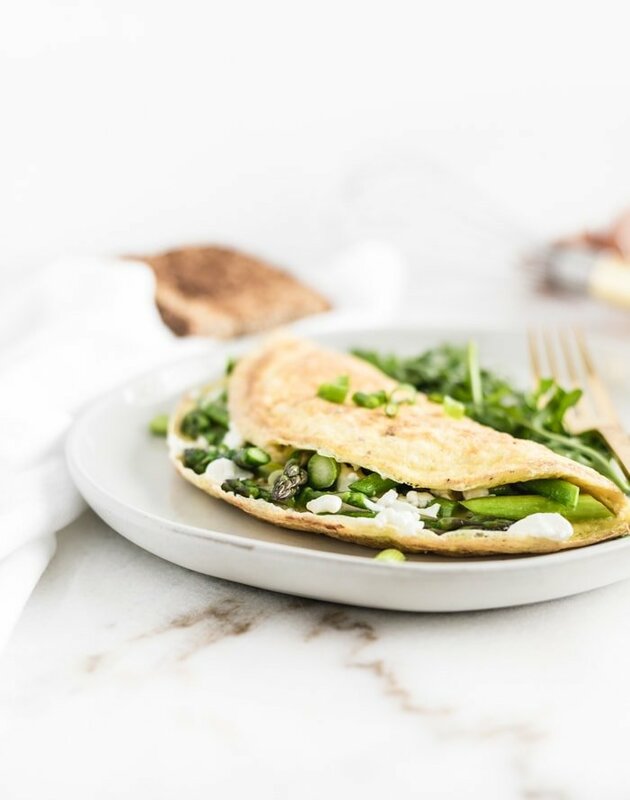 Sprinkle asparagus spears and goat cheese evenly over one half of the eggs. Gently fold the other half over onto half with the asparagus. Cover and continue to cook until eggs are completely set. Remove from heat and gently slide omelet onto a plate and top with chopped green onion.